Mowing the lawn was one of my chores at home and to be honest it wasn't my favourite task. I would try to find an excuse to get out of it - literally anything. The only time I would get away with not doing it was if it was raining, even if there was a tiny drop I'd down my tools and say 'I can't work in these conditions'. But clearly other guys will crack on with the job through rain, hail or shine, oh and tornados. Cecilia Wessels posted this incredible picture of her husband, who clearly wanted to make sure that grass is just right - even though an enormous storm was seemingly only a few hundred metres away. Her friends on Facebook couldn't believe his balls of steel. One person commented saying: "Batten down the hatches! That certainly looks mean. Run Forest Run!" He got a lot of praise on social media for his dedication to the house chore. According to Cecilia, her husband Theunis made a calculated decision to stay after taking an information session on tornados. He's told the Times Colonist: "It looks much closer if you look in the photo, but it was really far away. Well, not really far, far away, but it was far away from us." 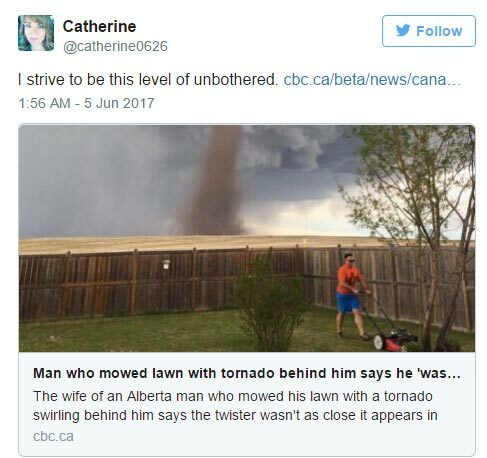 Cecilia was surprised at all the hype surrounding the picture: "I literally took the picture to show my mum and dad in South Africa, 'Look there's a tornado,' and now everyone is like, 'Why is your husband mowing the lawn?'" 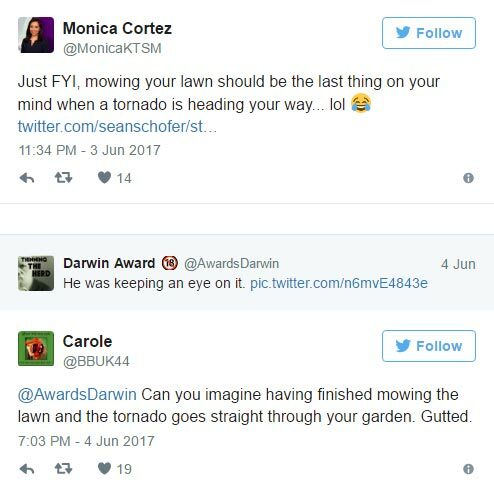 All I can tell you is that I would definitely not be dusting off that mower if that tornado was anywhere near my house. But good on him for ensuring that his grass is perfectly trimmed.